Poland’s Three Seas Initiative to date is a thinly-disguised geopolitical attempt to create a counter to the influence of both Russia to the east and of Germany to her west. Comparisons with Poland’s ill-fated Intermarium following World War I come to mind, not without reason. Following that war Poland’s leader Josef Pilsudski attempted to create a de facto union of states from the Black Sea to the Baltic to oppose both the Soviet Russian and the German empire under the name Intermarium. If we superimpose the states geographically from the various configurations of Intermarium with that of today’s Three Seas Initiative we see a clear resemblance, if you will, a kind of demarcation line between Germany in the west and the Russian Federation in the east. The similarities do not end there . The current Three Seas Initiative was formally founded in Dubrovnik in August 2016 and includes twelve central and eastern European states as members. Member countries span the space between the Baltic, the Adria and the Black Seas, hence the name. In addition to Poland and Croatia, members presently include Estonia, Latvia, Lithuania, the Czech Republic, Slovakia, Austria, Hungary, Bulgaria, Romania, and Slovenia. It’s second meeting in Warsaw in July 2017 was attended by the US President Trump, who gave the group his clear imprimatur. The question is what political or economic notions are driving Poland’s Three Seas Initiative? If we look more closely at its initial focus on energy, much becomes clearer. On July 6, 2017 en route to the Hamburg G20 Summit, US President Donald Trump made a high-profile stop in Warsaw to attend the second meeting of the Three Seas Initiative, a project first publicly proposed by Polish President Andrzej Duda. While the prime actors, Poland and Croatia, insist that the Three Seas Initiative is not at all geopolitical, but rather a forum to better integrate common infrastructure projects north-south in the new EU states of central Europe, it’s clear that the opposite is the case, it’s geopolitics. The real driver of the initiative, Washington, is clearly opposed to the German-Russian undersea Baltic Nord Stream II gas pipeline. Poland for her part stands to lose gas transit fees as the present transit routes of Russian gas via Ukraine and Poland would be phased out, but that is not the major driver. For Germany and for Russia, since the US-initiated February 2014 Kiev coup d’etat broke Ukraine’s ties with Russia, Ukraine transit of Russian gas has been a highly explosive and uncertain issue. In July in Warsaw Trump told his audience, “We are committed to securing your access to alternate sources of energy, so Poland and its neighbors are never again held hostage to a single supplier of energy.” The remarks were a not-so-veiled slap at Moscow where Washington alleged, falsely, in 2008 that Russia’s Gazprom cut gas supplies via Ukraine to western European consumers, something Moscow vehemently denied, stating it was done by Ukraine, with the almost certain backing of Washington. During the worst tensions of the Cold War Moscow never disrupted gas deliveries to Europe. They had no reason to do so in 2008, rather the opposite. However, US-backed President Viktor Yushchenko did. For their side Poland has dreams of using the Three Seas Initiative to make Poland into a new gas hub for the EU by importing US Liquified Natural Gas (LNG). To ship gas by LNG tanker is a costly process. It requires construction of special LNG terminals at both port of origin and of destination. The gas must first by transformed into a cold liquid state at about −260 °F, and loaded on the specially-made tankers. At destination a similar special LNG terminal is required where the gas can be again changed from liquid to gas state for ultimate consumption. All this is quite costly compared with pipeline gas routes. By contrast, Russia today delivers most of its gas via pipeline to the EU market. The cost of Russian gas as a result of this and other factors is significantly lower. For Poland this seems not to matter. They dream of replacing Ukraine as the gas transit to the EU with gas from Norway and LNG gas from the USA and perhaps gas from Qatar if Washington does not manage to disrupt that via Saudi sanctions. 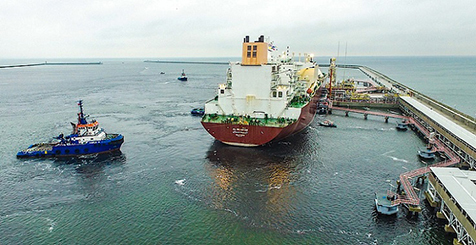 In late June, 2017 Poland’s new LNG terminal on the Baltic Sea at Swinoujscie received the first US LNG shipment from the Texas terminal of Cheniere Energy, currently the only US LNG terminal for export of LNG. During the Trump visit Poland’s president made clear he wanted long-term contracts with US LNG suppliers, ultimately to export to other countries of the Three Seas Initiative in place of Russian gas via Ukraine. In the process, Poland has dreams of replacing Russia also as supplier to Ukraine. Commenting on the Polish wish, Trump declared that “many more” US LNG shipments will be coming to Poland, but added that the price might rise. “Maybe we get your price up a little bit, but that’s ok, tough negotiations,” Trump told his audience in Warsaw. “We are sitting on massive energy, we are now exporters of energy. Whenever you need energy, just give us a call.” Tough negotiations, to be sure. Poland is building a strategy to make it the new energy hub of central Europe to replace Russian gas. This is at the heart of her Three Seas Initiative project. The new LNG terminal which was built at a cost of $ 1 billion can accept 5 billion cubic meters of gas per year, about one-third Poland’s nnual gas consumption. Poland is discussing doubling that. But that’s only the first part of what in fact is a NATO strategy to drive Russian gas out of EU markets. The strategy calls for making Poland a natural gas hub for Central Europe by linking Poland with Lithuania, Ukraine, Slovakia and the Czech Republic through interconnectors. The Polish Three Seas Initiative on energy infrastructure for importing US LNG is at one and the same time a strategy against German influence on EU energy markets and against Russia as major energy supplier. It is no wonder, given Poland’s gas hub ambitions that the country takes the lead in trying to block the German-Russian Nord Stream II under-Baltic gas pipeline. On November 1, Krzysztof Szczerski, head of the Chancellery of the President of Poland, announced that Poland’s government will do everything possible to block Nord Stream II. “We must be aware of the Nord Stream 2 issue, of what scale of interests we are facing,” he stated. “We are dealing with the interests of two large states (Germany and Russia-w.e. ), which will launch significant resources for the implementation of this project. Nord Stream 2 is not a side project, but a foundation to their interests. Simultaneously, it has a deep anti-European character (sic! ),” he said. Blocking Nord Stream II is also a high Washington priority. In June, 2017 the US Congress passed and President Trump signed into law severe new anti-Russian sanctions that among other aims explicitly targeted investment in Nord Stream II. The latest US economic sanctions against Russia take direct aim at the companies involved in backing the German-Russian Nord Stream II pipeline expansion across the Baltic, independent of Poland transit. If activated by the US President it would impose severe economic sanctions on EU companies involved in energy projects with Russia, such as Nord Stream II. The governments of Germany and Austria immediately registered vehement opposition to the latest possible US sanctions for obvious reasons. On June 15 the German and Austrian foreign ministers issued an unusually US-critical joint statement. They declared in very strong terms, “Europe’s energy supply is a matter for Europe, not the United States of America. We cannot accept … the threat of illegal extraterritorial sanctions against European companies that participate in the development of European energy supply.” Austria boycotted the Trump July 6 appearance before the Three Seas Initiative as well to signal its disapproval of the US gas talks. On November 21, 2017 Poland’s state gas firm PGNiG signed its first mid-term deal for liquefied natural gas (LNG) deliveries from the United States, as part of their plan to cut dependence on Russian supplies. PGNiG said that as part of the deal, signed with Centrica LNG Co. an Anglo-American energy group, it will receive nine LNG shipments in 2018-2022. The company has not revealed the volumes and prices agreed under the contract. Market indications are that the Polish government is paying a huge penalty for its Russo-phobia. Estimates of Russia’s Gazprom suggest that Poland must pay for winter 2017-18 in the range of $265-$295/1,000 cubic meters. Russian gas via pipeline is being delivered for an average price of $190/1,000 cu m. If accurate, it suggests that Poland is paying up to 50% more for its US LNG deliveries. To deliver that US LNG further to other Three Seas Initiative partner countries implies far higher gas prices in central Europe. What is developing are new major EU fault lines around the economic lifeline of energy, explicitly of natural gas energy. On the one side is the axis between especially Germany but also Austria, France and other EU states currently tied to major Russian gas supplies. Now emerges clearly the opposed axis of Poland allied with Washington. The naming of former ExxonMobil CEO Rex Tillerson as Secretary of State was no accident. It is part of a longer-term Washington strategy to make the United States, particularly with its recent exploitation of unconventional shale gas and shale oil, to become the dominant global energy power. US actions in Syria and with Saudi Arabia against Iran and Qatar fit into that strategy. Elimination or sharp curtailing of Qatar LNG exports, including to Poland, stands to benefit US gas suppliers. One reason for the Saudi sanctions on Qatar, imposed following the May 21 Trump meeting in Riyadh to discuss creation of an “Arab NATO,” had little to do with claims that Qatar supported the Muslim Brotherhood, something that had been true. Saudi Arabia for its part had spent billions backing every terror group in Syria from Al Qaeda-linked Al Nusra Front, to ISIS, in its effort to dislodge Bashar al Assad. The real issue for the US-backed Saudi embargo of Qatar was the fact that Qatar had begun secret negotiations with Iran on joint development of their shared Persian Gulf gas fields, the largest known in the world. Were that Qatar-Iran cooperation to happen with Bashar al Assad firmly in power after Russia’s intervention in Syria, it would change the entire world energy geopolitics in Russia’s favor and against the US role. In reality the Qatar blockade by the Saudis is aimed not at stopping radical terrorists. It is aimed at keeping Iranian and Qatari and, potentially, Syrian gas out of the EU gas market, estimated to become the world’s largest gas consumer in coming years. For Washington, Poland and their Three Seas Initiative are merely a chess play in a larger geopolitical game. The creation of Poland’s costly LNG terminal and its strategy to become a central European gas hub via the Three Seas Initiative was not an idea born in Warsaw. 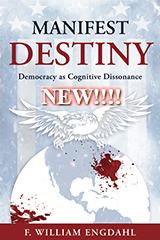 It came from Washington, specifically from the geopolitical strategists of the Atlantic Council. The Atlantic Council, created by Washington during the height of the Cold War, today is a major think tank of NATO policy financed by the Pentagon and US intelligence agencies. Official donors include the US Department of the Air Force; Department of the Army; Department of the Navy and the US National Intelligence Council. As well the US State Department and Energy Department contribute to the Council, along with NATO itself. In April, 2017 the Atlantic Council held a conference in Istanbul on the Three Seas strategy. The theme of the conference was “Making the Three Seas Initiative a Priority for Trump.” The keynote speech was made by General James L. Jones, chairman of the Atlantic Council, and former Obama National Security Advisor. The Atlantic Council was present in Warsaw in July for the Trump appearance at the three Seas Initiative meeting. Jones remarked in his April remarks on the Three Seas Initiative, “This is a truly transatlantic project that has enormous geopolitical, geostrategic, and geo-economic ramifications.” Jones went on to confirm that the Three Seas Initiative is designed to “alleviate the Kremlin’s strong hand in the European energy sector.” Jones noted also that he had spoken with Secretary Tillerson about the importance of supporting the Three Seas Initiative: “He understands it. He understands the strategic interest; he understands the economic interest,” Jones noted. On November 27 a quite different forum assembled, hosted by a member country of the Three Seas Initiative. The China – Central and Eastern Europe summit in Budapest, hosted by Prime Minister Viktor Orban included all 12 members of the Three Seas Initiative as well as non-EU states Serbia, Bosnia Herzogovina, Macedonia and Albania. The China-CEE countries discussed participation in China’s vast One Belt, One Road infrastructure to increase European-Eurasian trade flows. They discussed creation of new infrastructure funds, of currency cooperation and much more. It was a far contrast to the prospects of the Three Seas Initiative to spend billions in risky US shale gas LNG projects in order to alienate Russia and Germany further. The contrast of the China-CEE summit to that of the Three Seas Initiative couldn’t be more stark. It shows the geopolitical fault lines of what little positive Washington is able to offer its European NATO allies today in contrast with the possibilities to join with China and Russia in building a new Eurasian infrastructure to Europe.